Think your football days are over? Think again! At MYFC we are forever young! No age limit. No running. 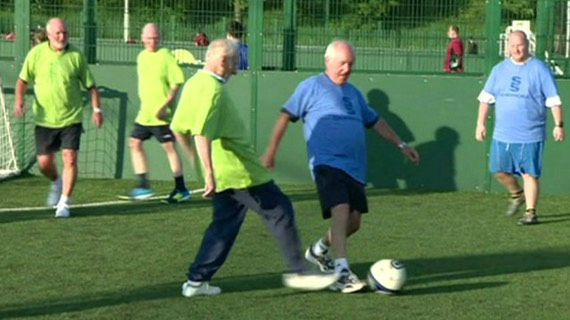 Walking football is a minimal contact sport with one main difference to standard football – no running. Play the game you love, reduce the chances of injury and enjoy the social side of being involved in football. Ideal for the over 50’s but open to all age groups, Walking Football is a great way to keep fit, learn skills, have fun and socialise all at the same time. The game is played on a pitch 20/40 yards in length and 15/30 yards in width (adjusted for the number of players available). The game is re-started via a kick, roll or throw-in. Anyone caught running concedes a free kick. Plenty of breaks for stretching and water occur. Walking Football is designed to help people keep an active lifestyle despite their age, as well as getting those back playing football who had to stop due to injuries. It also provides a great opportunity to sociliase. We meet and play at St John’s Marlborough, Granham Hill, Marlborough, SN8 4AX (indoor) on Monday’s between 6-7pm. MYFC are currently seeking players that are interested in playing walking football. If we receive further interest we will increase the offering with evening sessions as well.